Since it began in 1972, World Environment Day is a day has grown to become a global platform for public outreach and to take ownership of their environment and to actively engage in the protection of our earth from neighborhood clean-ups, action against wildlife crime, conservation of water & natural resources, maintaining air quality, replanting forests etc. "Connecting People to Nature", was the last year’s theme which implored us to protect the Earth that we share, appreciate its beauty and its importance and to think about how we are part of nature and how intimately we depend on it. This year’s theme, “Beat Plastic Pollution”, urges individuals, family, community and government to explore alternative solutions on how to reduce the use of one time use of plastics. A sustainable solution shall be found to replace daily use of the plastic. The excessive use of plastics is endangering human health and damaging marine health, polluting ocean and threatening bio diversity. •Plastic makes up 10% of all of the waste we generate. •In the last decade, we produced more plastic than in the whole last century. •Every year the world uses 500 billion plastic bags. •Each year, at least 8 million tonnes of plastic end up in the oceans, the equivalent of a full garbage truck every minute. •50 per cent of the plastic we use is single-use or disposable. •We buy 1 million plastic bottles every minute. 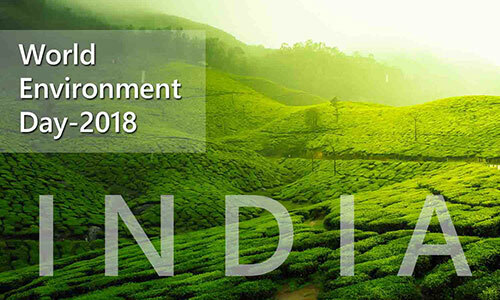 “India will be a great global host of 2018’s World Environment Day celebrations,” said Erik Solheim, United Nations Under-Secretary-General and Head, UN Environment at the announcement on Monday. Environment Minister Dr. Harsh Vardhan said that World Environment Day is a mighty task for India. “India is excited to host the World Environment Day this year on June 5. Indian philosophy and lifestyle have long been rooted in the concept of co-existence with nature. We are committed to making Planet Earth a cleaner and greener place”. India has demonstrated tremendous global leadership on climate change and the need to shift to a low carbon economy. Now India will galvanize greater action on plastics pollution and line up a strong public interest and participation in plastic clean-up drives in public areas, beach clean-up activities etc. and to lead the initiative by setting an example through a series of engaging activities and events generating strong public interest and participation. India is emerging as a leader of the highest recycling rates in the world. It can be instrumental in combating plastic pollution. By hosting World Environment Day 2018, the Indian government is accelerating its leadership on an issue of tremendous magnitude. Meanwhile, it is a good sign that India is going to organize such a big global event which will surely spread awareness on pollution-related issues. Let us come together and explore sustainable alternatives and urgently reduce the production and excessive use of single-use plastic polluting our oceans, damaging marine life and threatening human health. Let us wage a war against plastic pollution as the country is going to host ‘World Environment Day 2018’.